Last updated: May 30 2013 - Want to be notified of updates? Subscribe to this blog by entering your email on the Subscribe box. 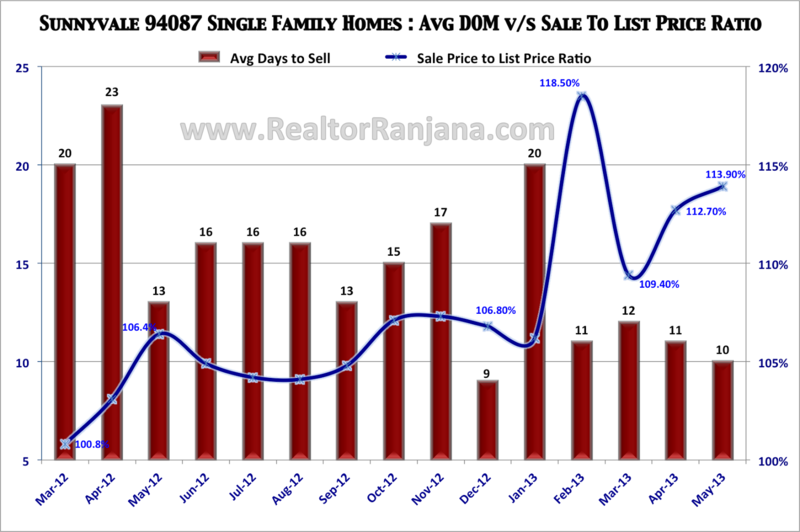 Sunnyvale's 94087 real estate market in May 2013 is looking as hot as prior months in that the demand trend shows that buyers are very competitively bidding up limited properties although the number of properties available has gone up somewhat. In the above chart, the red bars show the Average Days on Market (DOM) for single family homes in the Sunnyvale 94087 Real Estate area. In May 2013, houses stayed on market for an average of only 10 days in this area. In prior months, the number was only slightly higher. Clearly, this area has some exemplary demand that is yet to be satiated. Sunnyvale's 94087 real estate area inventory is still fairly low with few houses coming on sale in May - there were only 64 Active + Pending listings on average in May. As a result, buyers are still clamoring for the few houses. Many of the buyers have been putting in offers for months, only to be outbid by other more aggressive offers including all-cash buyers. Houses are selling at very significant premiums over List Price. The demand trend can be extrapolated from the Sales Price Over List Price Ratio in the above chart (the blue line). This ratio is at 113% over list price in February 2013 which means that houses are going at significantly higher premiums (13% in May '13) over List price. How did Sunnyvale 94087 Zip Code Area Townhomes and Condos perform? Following a similar trend as the Single Family Homes, the sales of Townhomes and Condominium units also exhibit a hot demand trajectory. In the above chart, the red bars represent the Days on Market numbers for each month. In May 2013, Townhomes and Condos were on real estate market for just around 13 days on average while in prior months they were in the market for even lesser number of days. The March 2013 Days on Market number is somewhat anomalous as the 29 days seems abnormal and may have been contributed by an outlier or a mistake. The Sales Price to List Price Ratio (blue line in the chart) reflects the hot demand in this segment of the market. In May 2013, Townhomes and Condominiums sold on average 10.10% above list price while in prior months they sold slightly lower or much higher ( refer to the values reflected in the blue line chart for prior months). Clearly the days of real estate selling for less than list price are long gone. This is an absolutely fantastic time to sell your home given the very limited inventory and high demand. But interest rates have moved up rapidly - in just a month. This may move buyers off market or bring down demand. 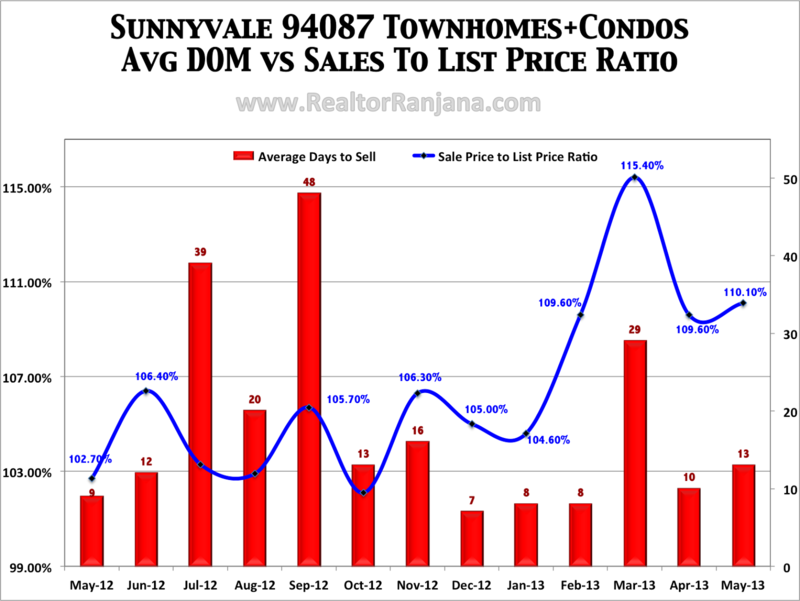 Want to see Sunnyvale 94087 Real Estate Area Recent Home Sales? 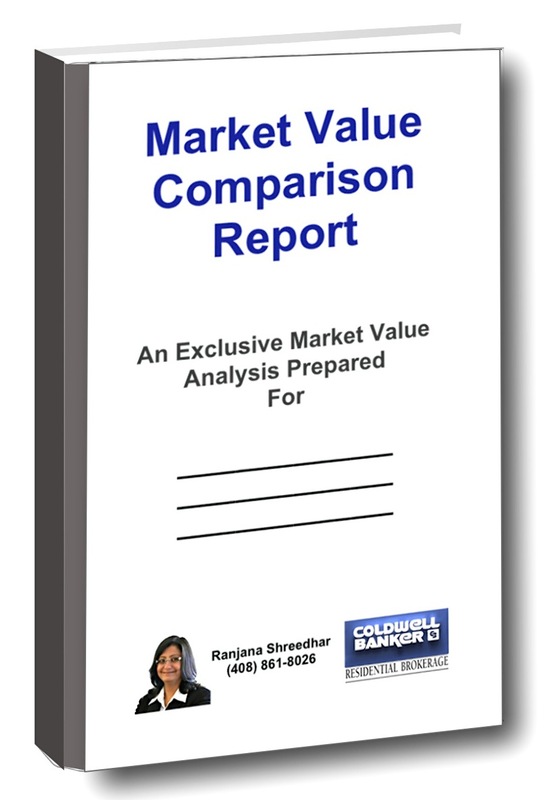 Why is Sunnyvale, particularly 94087, real estate area preferred by Buyers? Sunnyvale's 94087 area has great schools, amenities, public safety, top Silicon Valley employers, and freeways all of which are very desirable features that buyers look for. 156,000-square-foot office building at South Mathilda and West McKinley avenues in the Sunnyvale Town Center. 224,000 square feet in the Sunnyvale Research Center on East Arques Avenue. 108,712 square feet at a two-building campus owned by Peery-Arrillaga on 975 and 995 Benecia Ave. In addition to Apple's entry into Sunnyvale, Google will soon be moving into their new leased office near Mathilda and Moffet Field lending more attractiveness to Sunnyvale overall but particularly the localities with good schools which the 94087 zip code area has. The demand in this area is also a spill over effect from Cupertino where prices are at much higher levels and hence families looking to get into good school areas, tend to look in this area as an alternative.